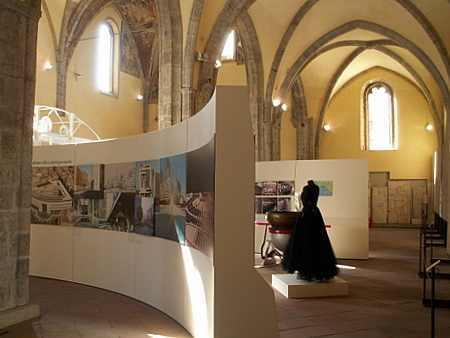 Province exhibit—There is a good little exhibit currently running in the old church of the Incoronata entitled Due Secoli della Provincia (Two centuries of the Province). It is a display of the problems of and progress in the province of Naples since the time of the French presence here under Murat. Exhibits show how the old province, Terra del lavoro, was subdivided; there are demographic charts, time-lines of the eruptions of Vesuvius, displays on the birth and growth of industry, the changes wrought by the unification of Italy, the phenomenon of massive emigration, the urban renewal (risanamento) at the turn of the 19th-to-20th century, and the growth of post-WWII Naples. The exhibit runs through November 15. Pino Daniele Lawsuit—Well-known Neapolitan cantautore (singer songwriter), Pino Daniele, is apparently going to have to cough up 500,000 euros for having defamed or slandered (I don't know the difference) Umberto Bossi, the head of the Lega Nord (Northern League). At the San Remo song festival in 2001, Daniele publicly (from the stage) referred to Bossi as "un uomo di merda" (a man of s---). I guess that's actionable, although it does not sit well with many Italians (not just Neapolitans) who know that Bossi has still to pay a cent or spend a day in jail for various episodes of having defamed the Republic of Italy by —at least on one occasion— saying that he uses the Italian flag for toilet paper. Bossi is a member of parliament and enjoys immunity even for such outbursts. 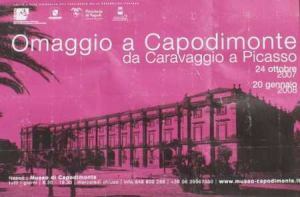 Capodimonte exhibit— Tribute to Capodimonte, from Caravaggio to Picasso is the title of a truly world-class exhibit now on at the Capodimonte museum and running through January 20, 2008. "Four centuries of Masterpieces" is the additional blurb on the poster.I will no doubt have to check this one out, just so that when my culture-vulture friends (her name is Laura) from abroad visit me, I don't have to listen to, "What?! You live here and you didn't go?!" Gasp. Sputter. Bagnoli boat harbor—On again/off again. Back in 2002/3, Naples put in a bid for the 2007 Americas Cup boat regatta or race or whatever they call it. Winning the bid would have then entailed building a new boat harbor in Bagnoli, the proposed site for the event. When the Americas Cup went to Valencia (boo! hiss!) and not Bagnoli, I figured that the plan for the harbor —which both I and Leonardo da Vinci had considered bizarre and unworkable— would have been shelved and that Bagnoli would have to limp along in some other way in its very ambitious plan to rejuvenate itself from a century of decay. A year ago, the Naples city council was moved out of its long-time assembly hall in the historic Maschio Angioino. The intention was that the structure could then begin to play more of a cultural role in the life of the city. So far, that has not happened. The space that was gained was to have served as a bee-hive of activity for "Programmazione e progettazione Grandi Eventi"; that is, "Programming and Planning of Major Events." These would include, among other things, the yearly Monuments in May open-house in which virtually every historic building in Naples is open to the public; the "Christmas in Naples" festivities; and the recently reorganized Piedigrotta Festival, the most famous of all annual Neapolitan street parades but which has fallen on hard times in recent decades. (They got it off the ground this year, though, but, sure enough, lack of practice showed when one of the floats of Mt. Vesuvius caught fire, leading spectators to ooh and aah for a while at how real it all looked —until it burned to the ground.) In any event, the space in the Maschio Angioino is still sitting there unused and untended.